Craigslist - How to Stop Ghosting, Flagging & Scams! Everything you need to know to Post and Make Money on Craigslist. How to Stop Craigslist Ghosting, Flagging, Scams & Much More! How to stop Craigslist Ghosting. How to deal with Ghosting on Craigslist. How to Stop Craigslist Flagging. How to deal with flagging on Craigslist. Craigslist Nigerian Scam, Craigslist car scam, Craigslist Apartment scam, Craigslist Job scam, Craigslist rental scam, Craigslist mail scam, Craigslist pay pal scam, Craigslist insurance scam, Craigslist fake name scam, Craigslist ticket scam, Craigslist lottery scam, and the list goes on. How to avoid scams on Craigslist. How to fight back against scams on Craigslist. How to power post on Craigslist for free. How to deal with the Craigslist Phone Verification problems. How to post in multiple locations on Craigslist. Since I'm sure most of you already know what Craigslist is, you may want to skip ahead and just click on the appropriate links on the right hand margin to get more information on all the topics listed above. For those of you who may not know what Craigslist is, or how best to use it, that is what this website is here to help you with. Need help with Ghosting or Flagging, visit our Posting Tutorial Page for a more detailed explanation of how to deal with the various posting problems you may encounter. Having trouble with the phone verification on Craigslist? Check out the Ghosting section for details on how to deal with it, and how to create hundreds of PVA accounts for free! Want to make EASY MONEY on Craigslist? The posting tutorial videos have some great ideas on monetizing Craigslist. Another Craigslist Jobs/Murder Scheme discovered: Read the Murder section for details. Find this site useful? Remember to link to us and tell your friends about this site. The only way we can stop the problems and scams at Craigslist is if everyone knows about them. UPDATED Ghosting and Posting strategies updated for recent Craigslist changes have been added in the Craigslist Posting Tutorial Section. As of early 2018 Craigslist has started charging a fee for posting in their most popular sections. We explain everything HERE. Hundreds of people are scammed by Craigslist Scammers everyday. Don't let this happen to you. Read our Scam section to understand many of the scams that occur of Craigslist daily. Craigslist Customer Service is HORRIBLE is the consensus from an independent customer service ratings site. If you thought you were the only one frustrated with the lack of service at Craigslist, you are not alone. This independent site rates customer service at Craigslist at an incredible 98.50% BAD. The comments reflect what I hear all the time. Read the Review and add your Comments Here. 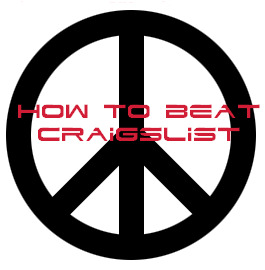 If you prefer www.twitter.com/beatcraigslist for the latest. This website is in no way associated with Craigslist. All of the information provided on this website is for Educational purposes only and should not be used in any way for Spamming, Flagging, Violating Craigslist TOS or any Illegal activity.